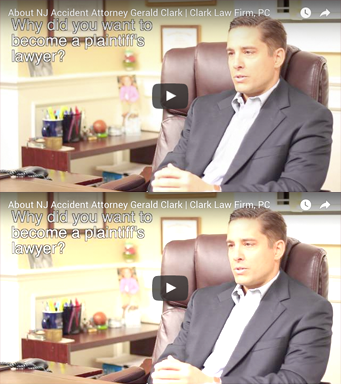 The following are recent significant jury verdicts and settlements of the Clark Law Firm, PC, including positive results for personal injury and accident victims in New Jersey. $550,000 settlement for carpenter who suffered hand lacerations on job site that ignored worker safety rules. $2.520 million settlement for construction worker who fell from ladder and was told by others he had no case. $2.725 million insurance settlement for pelvic fracture injuries sustained in car accident. $1.2 million insurance settlement for auto accident death caused by cell phone driver. $805,000 jury verdict for burn injuries caused by the fraudulent sale and installation of kitchen appliances. $525,000 jury verdict for severe fracture injuries sustained by carpenter on construction site. $350,000 insurance settlement for a union mason who sustained back injuries on a construction site. $120,000 jury verdict in auto accident involving injuries caused by driver who ran a red light.